My dissertation, funded by a stipend of Evangelisches Studienwerk Villigst e.V. 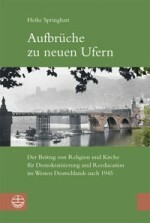 and Landesgraduiertenförderung Baden-Württemberg, focused the question and explored the details how and in how far religion and the churches were expected to play a significant role in Germany’s reeducation and democratization after 1945. My research is based on documents of OMGUS, the Office of Military Government of the United States in Post-War Germany. In the various fields of church work one can draw a differentiated picture that shows the guiding principles and perspectives of the Military Government. These were based on the conviction, that Protestant theology and the Protestant churches bear a great potential to foster democracy and pluralism. The book has its fundament on a broad analysis of material found in different German and American archives, for example the Institute for Contemporary History in Munich/ Germany, the State and the church archives in Karlsruhe and Stuttgart, the German Historical Institute and the National Archives in Washington, D.C. The book was awarded with the John Templeton Award for Theological Promise 2008, it was published by the Evangelische Verlagsanstalt Leipzig.